$978 - I love this one!!! Years ago, I walked by Barney's New York window in Beverly Hills and saw a Vera Wang wedding gown on the window. I became mesmerized by the style. Later on, as gal pals began to walk down the aisle, I went on many wedding dress shopping expeditions with them. 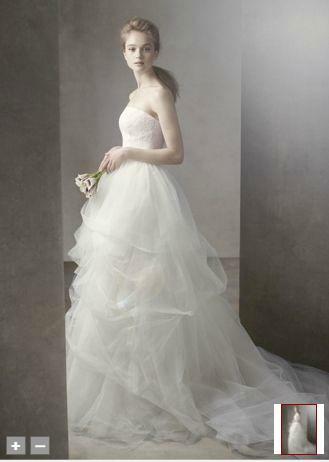 I became convinced if I ever get marry, I would have a Vera Wang wedding dress. Well time passed and I became more sensible. I ask myself if I want to spend an arm and a leg on a wedding dress, even if it is a Vera Wang. OR, can I buy some good furniture for the house? Anyway, by chance, I stumbled on Vera Wang White for David's Bridal. REALLY?! I think I am in adoration. I am curious to see what is the difference between a Vera Wang costing $5000+ vs these lovelies under $1500. Without trying the dress and feeling the material, it is hard to tell from the images. However I am now truly curious. What do you think? Has anyone seen these dresses before?? Normally I am super practical but for my wedding dress, it will be romantic and elegant. What about you, what is your dream wedding gown? Karen Millen dresses are ladies' favoite, I also bought a new dress on one Karen Millen outlet in uk. I would definitely check out the collection though haven't seen it in person. I know a friend that got a David's bridal dress and I was pleasantly surprised by the quality! 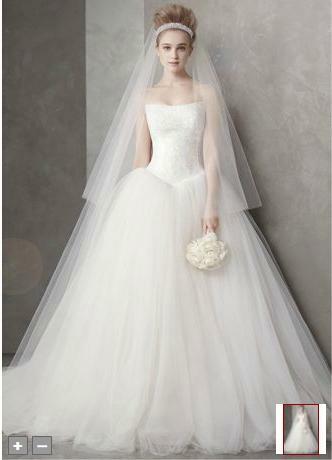 my friend got a Vera Wang recently and while it is similar to the romantic style above, it is much more intricate. But not everyone needs the couture details right? These gowns are still lovely! I hope one day I can have the Karen Millen Dresses for my wedding dress. 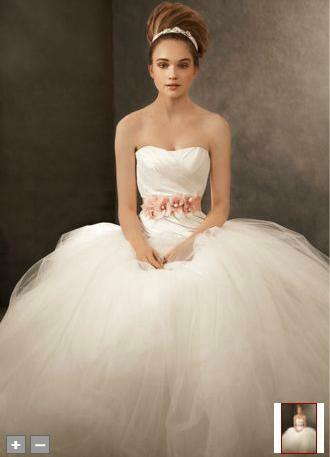 Yeah, Vera Wang Bridal Dresses are marvelous. I am very grateful for Vera Wang designers, as they provide most respected and prominent wedding dresses in the worldwide.